Japanese American internees, residents of San Pedro, arrive at Santa Anita Assembly Center. Milton Eisenhower, brother of General Dwight D. Eisenhower, head of War Relocation Authority (WRA), said in 1942, "In San Pedro, houses and hotels, occupied almost exclusively by Japanese, were within a stone’s throw of a naval air base, shipyards, oil wells. Japanese fishermen had every opportunity to watch the movement of our ships. Japanese farmers were living close to vital aircraft plants. 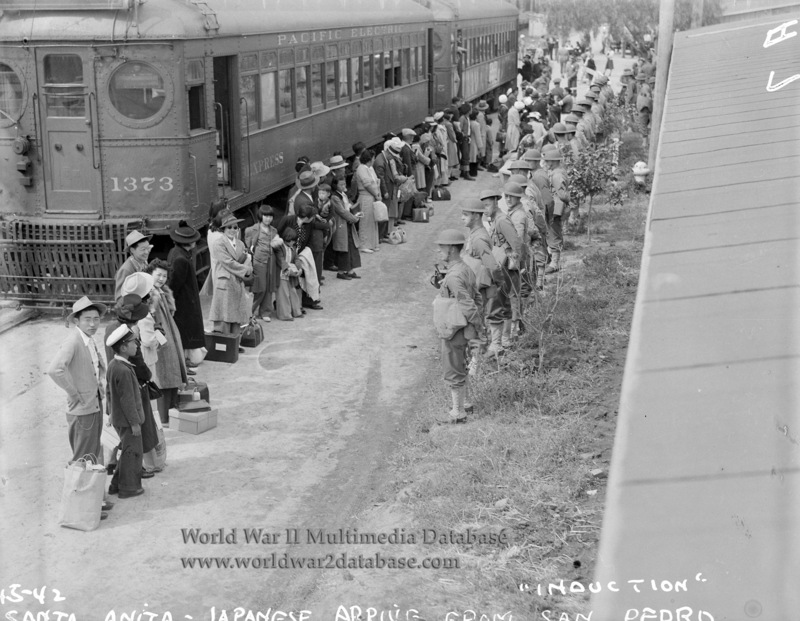 So, as a first step, all Japanese were required to move from critical areas such as these." San Pedro's Terminal Island was selected as a test to see how Japanese Americans would react to relocation. On February 26, 1942, the US Navy gave residents 48 hours to leave. Home to a Japanese immigrant fishing community of about 3,000 people, half had American or Canadian citizenship. Dr. Yoshihiko Fujikawa, a resident, said "It was during these 48 hours that I witnessed unscrupulous vultures in the form of human beings taking advantage of bewildered housewives whose husbands had been rounded up by the FBI within 48 hours after Pearl Harbor. They were offered pittances for practically new furniture and applicances: refrigerators, radio consoles, et-cetera, as well as cars, and many were falling prey to these people." The day after "evacuation," Terminal Island was littered with abandoned possessions. Today, there is little trace of the Japanese community except one small monument. The rest of San Pedro's Japanese American community was interned in April 1942. Terminal Island became a Navy airfield.